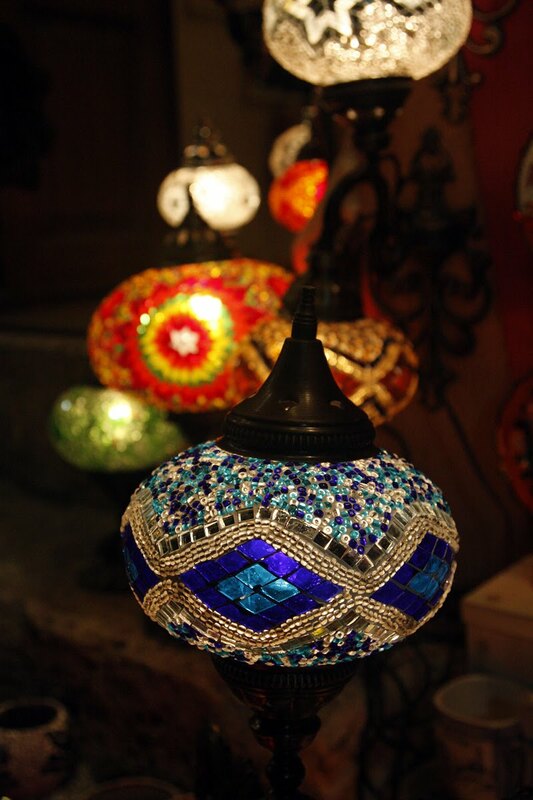 We've been in Turkey for just over one month and it's been a most interesting trip. 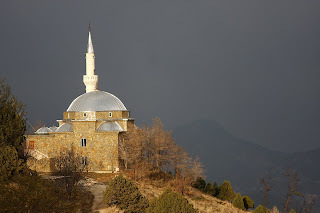 The culture and country has a much different, slightly rougher, feel than the other European places we've visited (Spain, France, Greece), but Turkey is charming in its own unique way. The landscape is far more varied than I would have expected. The Mediterranean coast is littered with small inlets and beaches, perfect for snorkelling and swimming, and the mountains that lead inland are much bigger and more impressive than I would have imagined. In an hour, you can drive to 6,000 feet and find snow in the winter months. What follows are some random images from our travels so far (climbing beta and images at the end). Mosque in Istanbul. 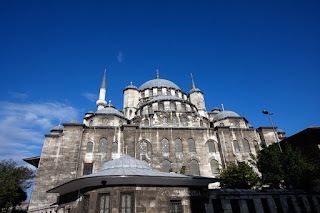 This is a big, hectic city, but there are a few tourist sites worth exploring (Blue Mosque, Aya Sofia, etc). Beach on the south coast of Turkey with fishing boats anchored close to shore. Most of the beaches are pebble, but this beach at Phaselis (45 minutes from Antalya) is wonderfully sandy. A view looking east along the coast toward the city of Antalay. Large ships can be seen awaiting the turn at the large port. 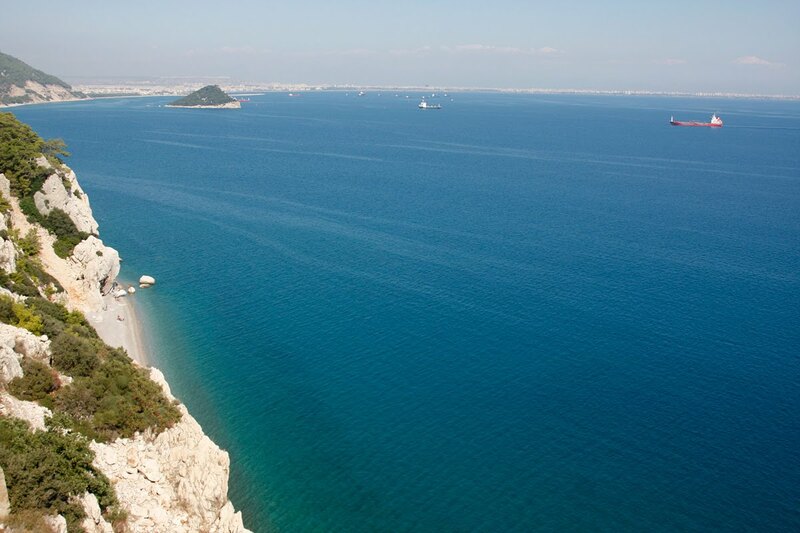 This pebble beach is in a dramatic cliff side setting only 15 minutes from the western side of the city. Incredible tombs carved into the cliffs at Termesos, a 2,000-year-old city ruin about 30 minutes from Antalya. 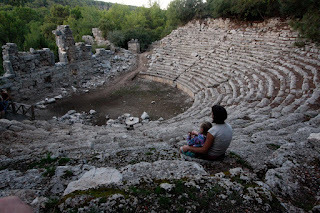 An ancient Roman theatre ruin. This one is at Phaselis. The old town in Antalya (Kaleci) has a very quaint, European feel with narrow, shop-lined streets. This picture was taken inside a glass lamp store. 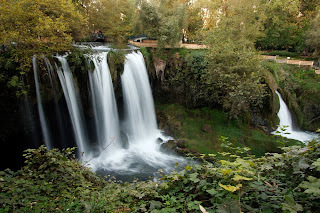 Duden falls on the north side of Antalya. This city park features waterfalls in a pretty setting with an interesting series of tunnels that weave behind the falls. Mosque at the ski area, Sarklikent, situated in the mountains at 5,000 ft about 1 hour from Antalya. 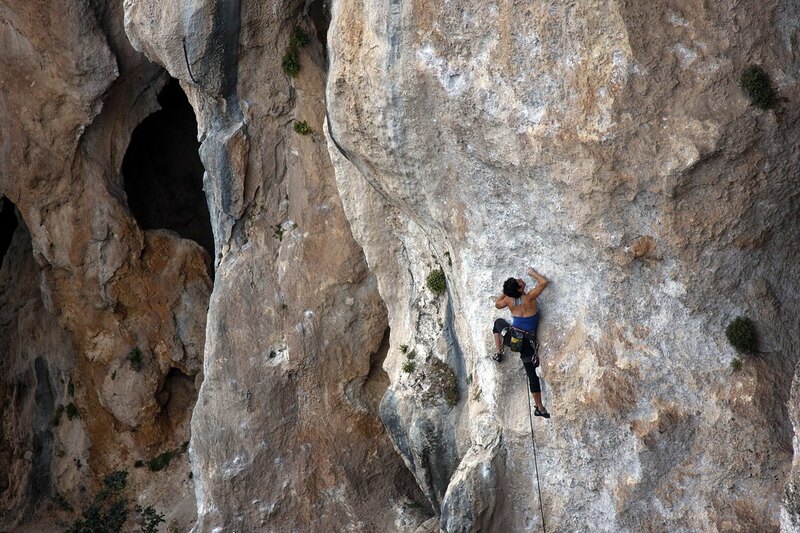 Currently, the focus of the climbing in Turkey is around the large city of Antalya on the southern coast. This part of the country is virtually built on limestone, so future developments seem immanent. 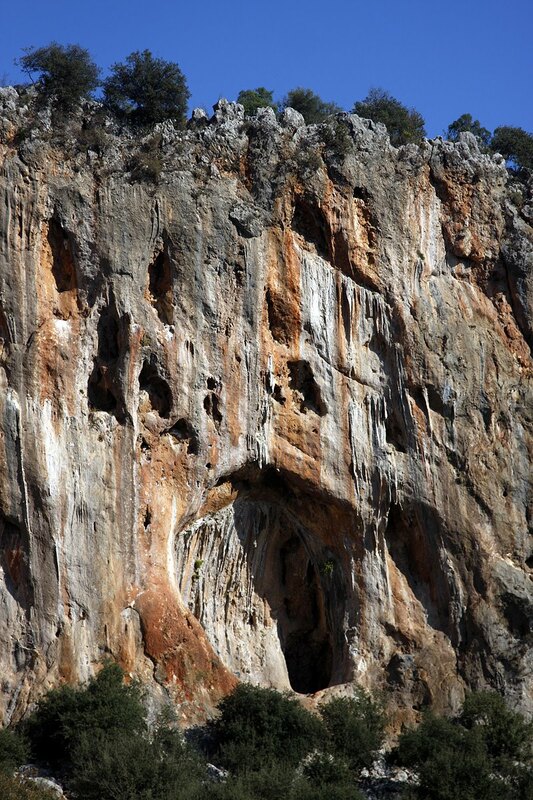 Right now, Geyikbayiri is the major climbing zone that's on the international circuit, and it's about a 20 minute drive from the Konyaalti zone of Antalya. Most climbers without a car stay adjacent to the crags at one of many camping areas, but it's feasible to stay in Konyaalti and commute everyday (if you have a car). If you stay in the city, it's urban living with a large city beach close by. 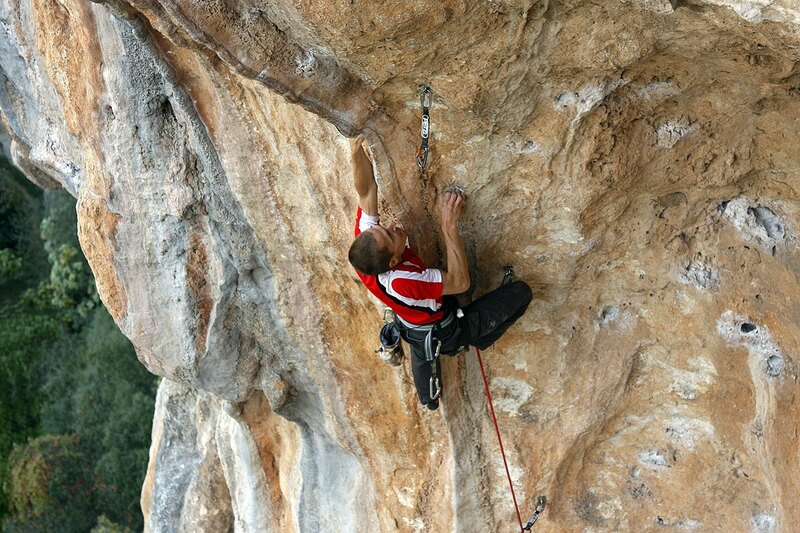 If you stay at the climbing area, it's county living with few conveniences (you must go to Antalya for groceries). 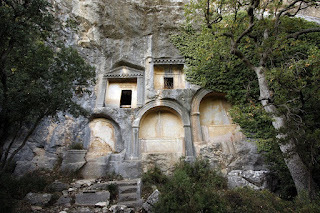 The area is beautiful and the limestone is spectacular with many cliffs and varied angles. 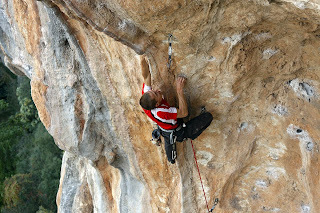 Tufa drips define the style on the most popular routes and the climbing is usually vertical to moderately overhanging. The stone is as good as anywhere, however there is one significant issue to climbing in this area, especially in the fall and early winter: the majority of the cliffs face due south and the climate is very warm (highs of 45-50 degrees mid-summer). 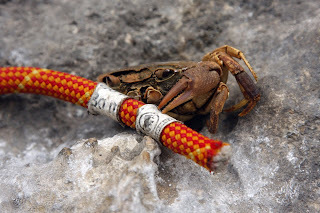 If you are lizard-like and enjoy roasting in the midday sun, this will not present a problem, but if you are looking for decent climbing conditions, sunny days will be spent at the only north-facing cliff in the area, Trebenna. 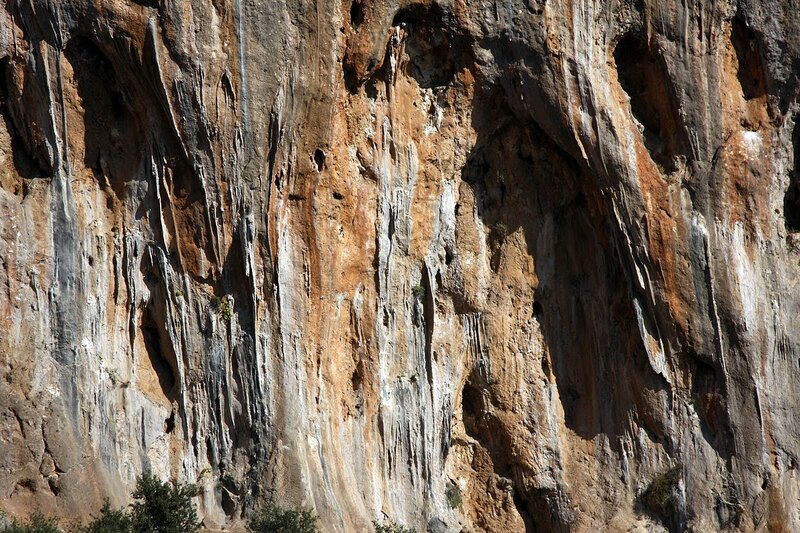 Trebenna is a good cliff, with about 5o routes ranging from 5.9 to 5.14c, but the concentration of quality seems to be from about 5.11a to 5.13a. Routes on either side of these grades are scarce and the quality isn't as good. Also, the entire zone begins off a bushy ledge, which causes the crag to feel even more crowded than it already is (believe me, it gets crowded). You can't really back up, so everyone has to cluster underneath the climbs. So, what's the final word? If you are hoping to visit in the fall, I'd not plan on spending a lengthy trip here. 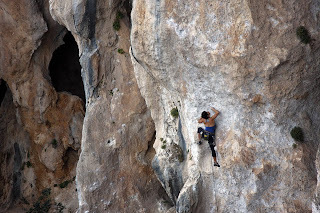 Geyikbayiri is probably best combined with a trip to Kalymnos, which has FAR more climbing in a variety of styles and aspects; you can always find sun or shade. Ideally, you want to be here mid-winter (December, January or February), but then you run a greater risk of rainfall, I believe. Spring might be better because the sun might track higher in the sky providing some early morning or late day sun on the main cliff band. I'd ask a local before committing to either of these options, though. Regardless, the stone is excellent and the country is very interesting. If you are curious, come and check it out! 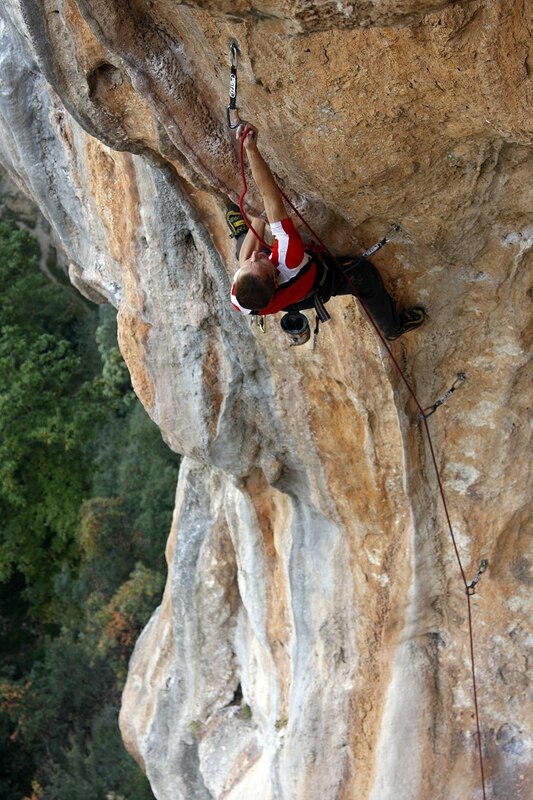 Climbing at Trebenna on Yin Yang (5.12d). A very tricky and technical crux down low (pictured here) is followed by great overhanging climbing on tufas and holes with a steep power crux at the top. 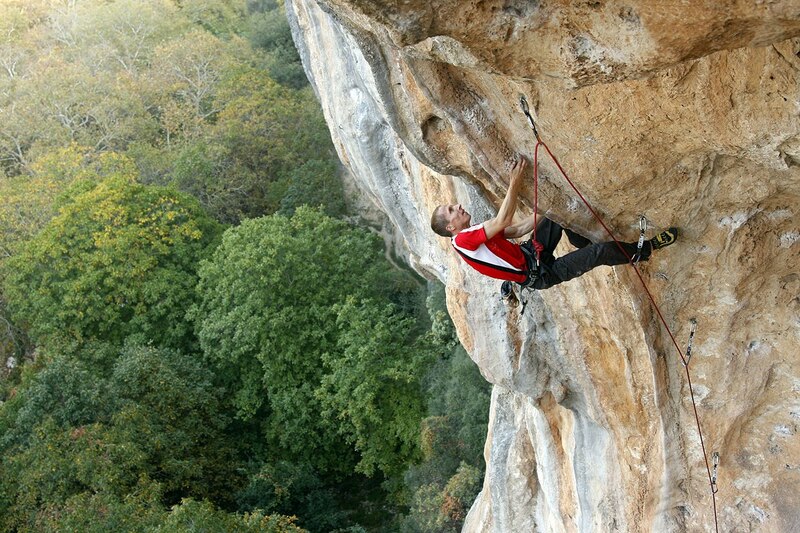 Climbing at Trebenna on Fight the Butcher (5.11d). 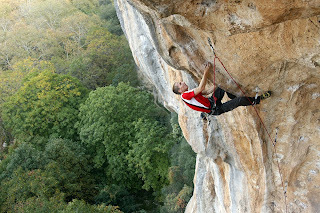 This is a rope-stretching 35m pitch up an interesting arete and crack. Sucker Punched (5.11d) at Trebenna. 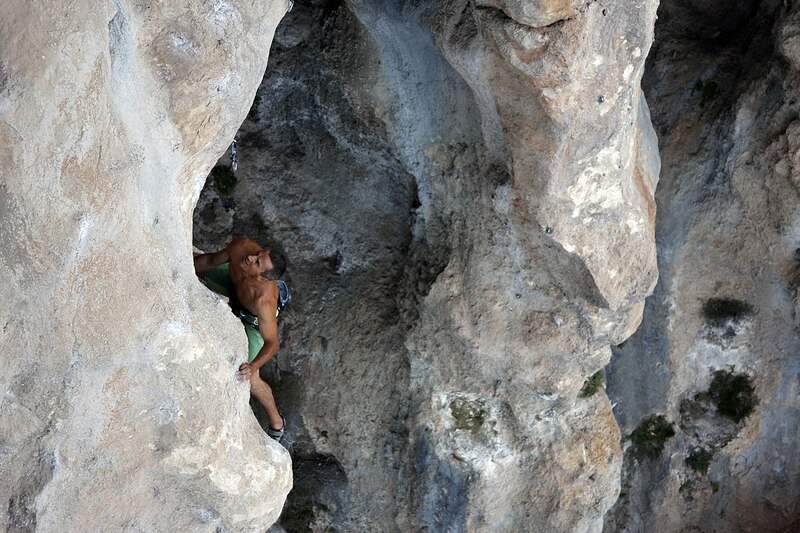 Unlike the routes in the vicinty, this one features crimpy face climbing. The magnificent Anaconda (5.12d, burly). This route follows a snake-like narrow tufa up an orange, overhanging wall. On-sights are rare. 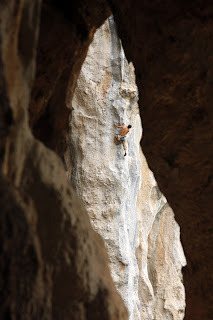 We hope the weather cools off later in the month, but based on my experiences climbing in the sun in Spain, it would have to get much, much colder before the midday sun would provide crisp climbing conditions at Sarkit, etc. If anyone is planning a future trip, feel free to contact me for trip beta. Enjoy the rest of the fall! Hey guys. Welcome to Turkey. I hope you have a great trip and enjoy great rock, amazing weather, and crazy amazing, history. Wauw great stuff! 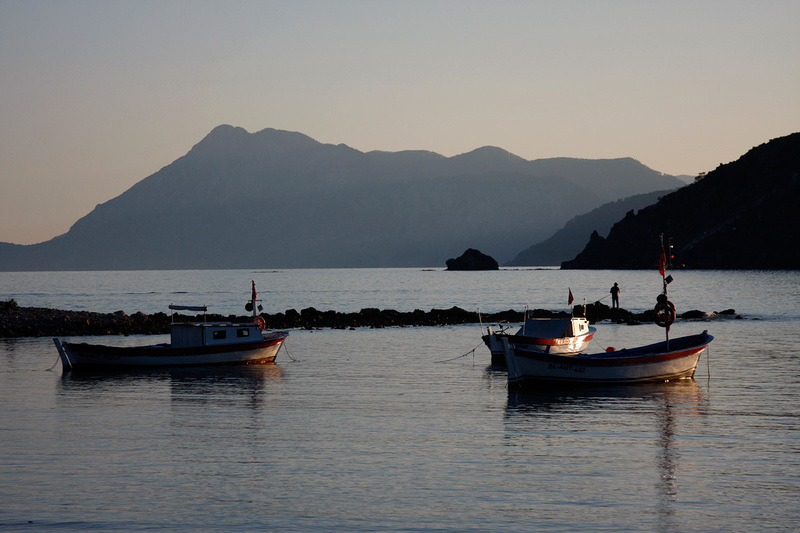 A lot of amazing places to visit around Antalya. 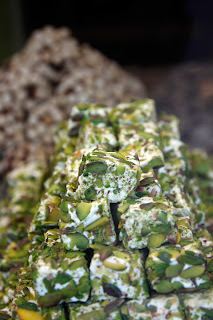 I hope you do not mind that I use some of your input for my new hotels website. Off course I will you the credits. Thanks again!